The 'Shadow Lines', to borrow the term from Amitav Ghosh, running through the Indian Hotel in Bohri Mohalla is amazing. 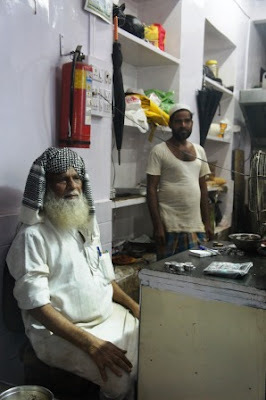 The owner, the sprightly Haji chacha, is a Sunni Muslim who came to Mumbai from Uttar Pradesh and opened shop in its Bohri Neighbourhood. While he is from UP, the food here draws its genealogy from all across Asia. His son. Asif, tells me that the food is from Burma and the baida (egg) rotis are called Barma rotis here. Pockets of flour, stuffed with meat, enveloped in egg and deep fried, these are similar to the Moghlai parathas of Kolkata and the Martabaks of Malaysia. Then there are the chicken and buff rolls, the hottest selling items here apparently. They are nothing like the rolls of Kolkata. In fact they are called Karachi rolls here. Would be interesting to see if you get the cousins of these dishes in Myanmar or Karachi. They make the iconic bheja fry here with goat's brain scrambled on a flat griddled with chilli powder, garam masala, cumin and coriander, chopped chillies, onions and tomatoes, the spices sometimes over shrouding the creamy offal. 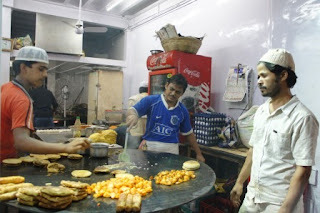 Though as famous as the bheja masala, my preference would be for the gurda masala which they make with goat kidneys and which has a nice scrunchy bite to it. If this is too much meat to handle, try out the cubed potatoes, twice cooked in chaat masala. They are so enticing that meat eaters gulp them in before vegetarians can reach for these potatoes. The name 'Indian Hotel' is very ambitious and comes from a time when people used to call restaurants 'hotels'. Some still do. In reality it's a basic shop where the food is cooked in front of you and you sit on the bench outside and eat. Or go to the small garage-like room opposite to the shop to eat. Do check out this video on Indian Hotel in The Finely Chopped YouTube channel.